Make no mistake about it, I’m not an endurance athlete, nor am I training to become one, nor do I have any desire to be one. What I do have is a desire to maintain an active, healthy lifestyle. I’ve found you can pick up quite a few good tips about eating exercising from books that deal with athletic training. 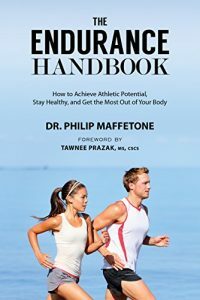 Since I’ve already a number of books on fitness and nutrition, The Endurance Handbook was more a review for me than breaking new ground. It reinforced a lot of items that I’ve either read or am already doing. However, there was one key takeaway I got out of the book as it applied to exercise. Maffetone makes a point that he emphasizes numerous times about over training. The MAF Method is not about getting to your highest heart rate and staying there. Instead, it’s about getting to a constant heart rate that is in the ‘fat-burning’ zone that you can maintain for long stretches of time. It’s a vital part of teaching your body to burn fat for energy rather than carbohydrates. In scientific terms, his goal is to keep your body in an aerobic state where it is burning fat rather than an anaerobic state where it burns carbs and sugars. This is a simplified overview. I would encourage you to pick up the book if you’re interested in learning more. For me, The Endurance Handbook isn’t a Must Read. It was too much of a rehash of things I already knew. However, if you are heavily into fitness and endurance activities are your thing, then you should definitely pick up a copy of the book. Dr. Maffetone is an expert in his field. I’m sure you’ll pick up a number of things to incorporate into your diet or training routine. And even if you don’t, it will help reinforce all of the things that you’re already doing.